This Warner K2xG10-12v-04 B-Track linear actuator has a 4" stroke and a 10:1 gear ratio for use in rugged duty applications such as scissor and dump box lifts. This K2x series unit is capable of moving loads up to 1200 pounds at a rate of 1 inch per second. 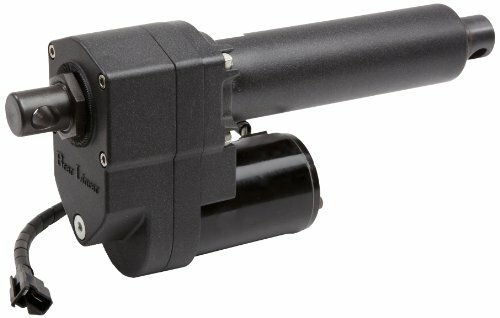 The linear actuator uses a ball bearing screw nut for transferring the load, and has double-ended ball bearing motors and hardened gears for rugged duty use. Its protective coatings and O-ring seals provide an Ingress Protection (IP) 65 rating for protection against dust and liquids, and the unit is permanently lubricated. The 12VDC motor has thermal overload protection and has an operating voltage range of 10 to 16VDC. This linear motion actuator is suitable for use in applications such as paving equipment, deck and implement lifts for tractors, and agricultural spray booms. Linear motion actuators are independent units that, when combined with a switch and power source, push or pull loads in a straight line. Actuator types (mechanical, hydraulic, pneumatic, piezoelectric, electro-mechanical, and telescoping) vary and their application is determined by the power source available, as well as the load and space requirements. Linear motion actuators are used in a variety of applications, such as computer disk drives, deck and implement lifts for tractors, wheelchair lifts on a vehicle, and flow control mechanisms, such as flood gates on a dam. Warner Linear manufactures electromechanical actuators and controls. The company, founded in 1927, is headquartered in Belvidere, IL. View More In Linear Motion Products. If you have any questions about this product by Warner Linear, contact us by completing and submitting the form below. If you are looking for a specif part number, please include it with your message. TEN-HIGH 1200mm 47.24inch Travel Length , linear guide slide module Leather belt 3M with 17 Nema 42 stepper motor, XP series Leather belt 3M Linear module sliding table Motion system.